While social-network-portability documents what to do to put your site on the open social web and be a good user-centric service in general, it's been noted that not everyone follows such advice and instead opts for a bunch of alternative either one-off (wasteful) or downright user-unfriendly tactics. This page documents such anti-patterns of social network design and implementation and provides (unfortunately) real world examples of such badly designed sites. Many social networking sites ask you to upload your address book, or "Find Your Friends", when what the feature really does is Spam your contacts. These sites seem to use your uploading of an address book as tacit/implied permission to spam all your friends with invites, which will annoy your friends, and make you look foolish. "apologies to anyone who got an annoying invite from me to some stupid social network. The things men make me do"
Making users annoy, look dumb to their friends, and feel compelled to apologize is not good design. 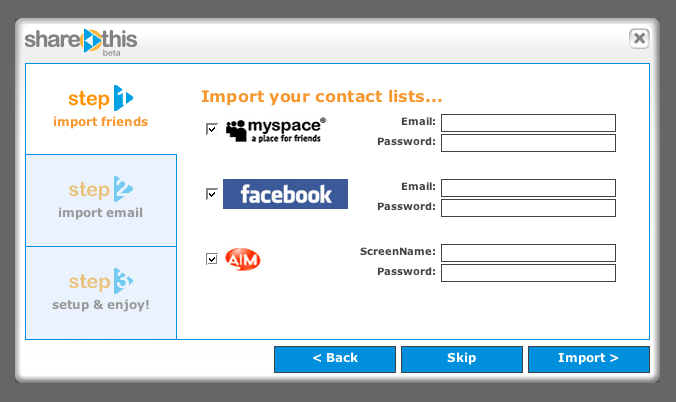 "getting a special email account with no contacts for signing up to social networks. Then, I won't mind when they hijack my address book." Apparently this contact spam has in at least one case taken the form of instant-message spam (spim) which is then used to spread a contact-based virus! 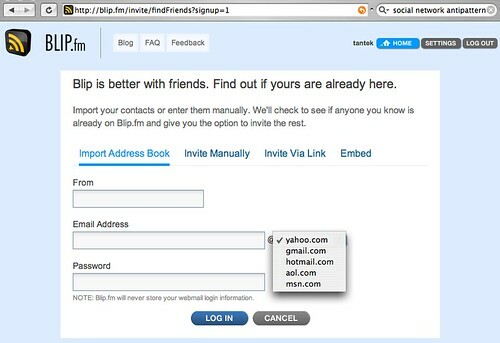 There's a contacts based virus going around, don't give your IM, Yahoo, Google Contacts etc. info to any website! Solution: support social-network-portability instead, not address book spamming. Bebo appears to have a user interface that makes it too easy for users to unintentionally spam everyone in their address book. "What the hell, I stupidly sent bebo invites to eveyone in my address book. Boo!" "signed up for bebo. sorry to everyone in my address book who got spammed by the sign up. 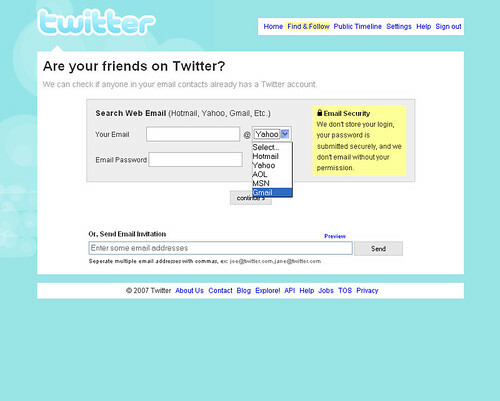 I thought it would work more like twitter"
"Considering deleting the duplicate Bebo invitations I'm getting. Everyone has 3+ addresses for me. Another address book spam engine. Hurray!" "goddamn Bebo just invited *everyone* in my Yahoo address book. I don't think I told it to do that. WTF!? Beware!" Goodreads also has a user interface that misleads even very web-savvy users into unintentionally spamming everyone in their address book. Micki Krimmell wrote both a blog post and a post on GetSatisfaction describing her experience with being tricked into spamming all her friends. 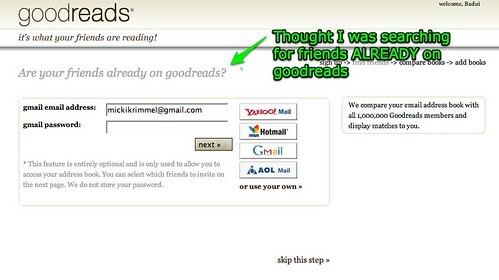 A representative from Goodreads has followed up on both Micki's blog post and Getsatisfaction post, however, as far as is known, Goodreads' user interface has not been changed/improved accordingly to be less misleading. Quechup has a feature to "find your friends" which, even if it says "no contact present" will spam all your contacts in your address book and thus annoy all your friends and embarrass you. Clearly it is not just finding your friends from your address book, it is inviting everyone in your address book. 2007-09-02 Mashable: Are You Getting Quechup Spammed? 2007-09-05 Brian Oberkirch: should google help us stop quechup spam? "Enter your email login and password" anti-pattern. Giving any site your login credentials/permissions for another site or service is a very bad idea. You cannot trust that the site will treat your login credentials with proper care (e.g. Quechup uses this antipattern to implement the spam everyone your the address book antipattern above). It is also very bad user interface design. These sites that ask for your login (whether gmail or other services) are teaching users a very bad habit, a habit that is akin to what phishing sites depend on. Essentially you are teaching a user that this type of form is safe whereas it actually presents quite the danger given the number of phishing sites out there. Don't ask users for their login and password to another site like gMail etc. drop import support for the sites that don't offer hCard+XFN friends lists and/or OAuth. 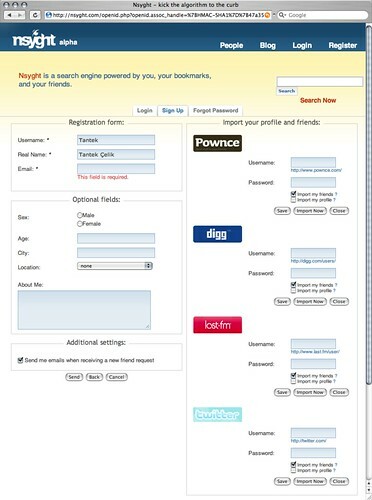 Note that last.fm dropped support for their password anti-pattern support in the recent (2008 June) redesign! and if you must, support site-specific proprietary APIs which depend on OAuth, e.g. Google Address Book API, Yahoo Address Book API. 2007-08-14 Brian Oberkirch: Two social system design trends that should really, really stop. like now. 2008-06-04 Jeremy Keith: Making contact (mentions the Yahoo announcement of the release of their Address Book API). 2008-07-15 Jeremy Keith: Why does Pownce keep killing kittens with the password anti-pattern? 2008-09-23 Jeremy Keith pownces Either the password anti-pattern goes or I do. Some major players are not helping the cause. Just because someone/something else big is misbehaving, that is no excuse for you to do so. We are following pretty common practice. Just because many other folks are misbehaving, that is no excuse for you to. Variant: We are implementing the same code as Facebook and Twitter so we went for best practices. Implementing the same code is not best practice. Implementing the same code in this case is the lowest common denominator. We aren't in a terribly strong position to drop support. Of course you are! Precisely because you *are* small. You have less to lose. If you pick a public fight with a misbehaving big player over this, guess who wins? If the press covers it as little guy vs the big guy etc. narrative. Exactly - this won't affect it. But maybe a little positive publicity will help. We could implement the OAuth-based proprietary address book APIs, but we'd have to invest the development time to do Facebook, Yahoo, and Google. Disable the the password anti-pattern code in the meantime. The pragmatic downside is that our growth is stagnant, we need to do features that'll benefit us, and this isn't at the top of the list of features that can do that for us. This is the opportunity cost argument. It is the same problem with fixing polluting factories vs. building new factories. Why are people threatening to leave us or worse? Without community pressure/embarrassment, companies don't change. I think we've earned a little benefit of the doubt that we're not 'the industry'. Having a "polluting" interface that is on every day means no benefit of the doubt. The password anti-pattern = teaching people to pollute themselves. Just because everyone else pollutes, doesn't mean it makes it right for you to do so. Polluting factories need to be fixed just as much as new factories need to be built. Without environmentalist pressure/embarrassment, polluting companies don't change. Why not focus your efforts on the huuuuuuge polluters like instead of my small company? Because easier to apply enough pressure to get smaller guys to change first. Same tactics worked for environmentalists. Then they would use smaller victories to earn bigger victories, until they had racked up enough victories to make the big guys look *really* bad. 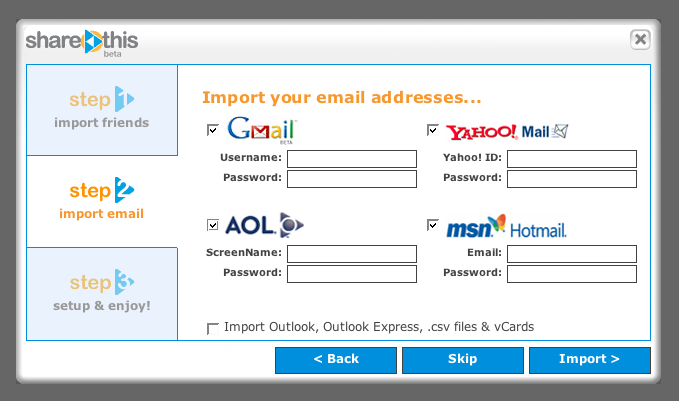 Blip.fm - Their "Import Address Book" functionality requests that you enter your username and password for your email provider(s): yahoo, gmail, hotmail, aol, msn. Appears to encourage users to enter their email address and password into something visually resembling (but easy to mimic) a Facebook popup window on any site. 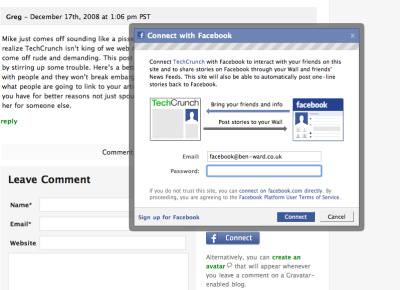 Thus all a malicious site would have to do is put up a button saying "Login with Facebook Connect", then display an identically styled virtual popup, and the user, who has been taught by the Facebook Connect UI, will simply enter their email address and password. There's also a more detailed follow up on Ben's views of the Facebook Connect UI on his blog — and complements for the alternate version, whereby it uses the iframe to improve the UX for users who are already logged in to Facebook. There's a bit more snark as well, for those who are into that. Update: This issue was fixed by Facebook. They now use a separate pop-up window, complete with browser chrome, to log in when you're not already signed in to Facebook. 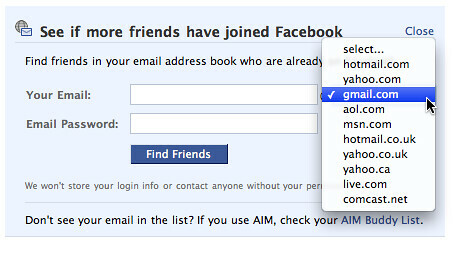 Facebook - Their "see if more friends have joined Facebook" feature provides you with a popup menu to enter passwords for numerous sites. See the support thread on GetSatisfaction "Stop asking for Twitter passwords" for more. Unfortunately the "import from Digg, Pownce, Last.fm, and Twitter" feature depends on entering your username and password to those sites, which is ironic since those sites support microformats and social-network-portability! 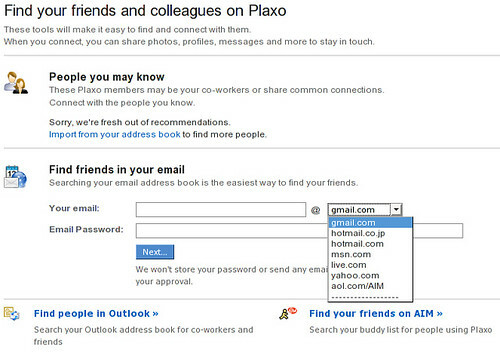 plaxo - Asks in several forms for passwords of different mail services. 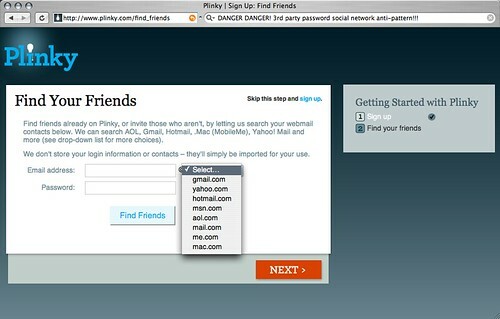 Plinky's "Find Your Friends" feature, which it presents to every newly signed up user, asks for your email address and password for a variety of services. Google, Yahoo, and Microsoft all support browser-based delegated authorization apis for contacts. Plinky should use those apis. DeWitt - You make a good point. I'll discuss it with the team Monday. In other news, we do support OAuth for posting to Blogger. ShareThis asks for your username and password to email services and social network sites. Because of the proximity of "Email Address" and "Password" input fields it is easy to mistake this for asking for your email address and email password. Perhaps it is asking for your email password? Or perhaps it asks for that later in the process? Screenshots would help. See the GetSatisfaction support thread "Asking for 3rd party passwords" for more. StockTwits.com asks you to "Login" with your Twitter username and password. StockTwits is not run by Twitter, therefore they are asking you for your username and password to another site. 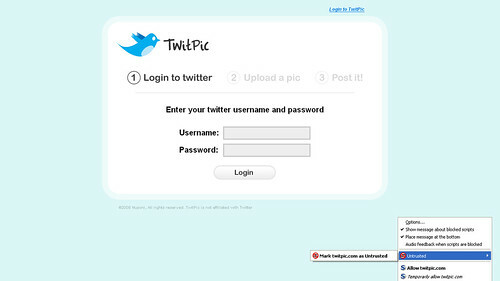 Twitpic asks you to enter your Twitter username and password. They are not the same site, nor are they run by the same people or company. Twitter is a service that many users (including many of us active with microformats) love and adore and use constantly. Plus they implement microformats (e.g. hcard supporting user profiles and hcard xfn supporting friends lists)! However, we still need to call them out for supporting the third-party password anti-pattern. As co-authors of Oauth, please Twitter, implement and evangelize that path (perhaps even on that "are your friends on" page), rather than this anti-pattern. 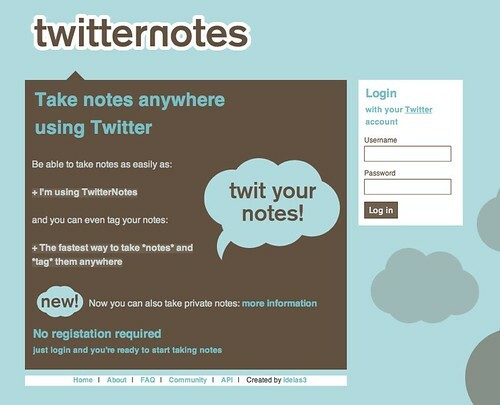 TwitterNotes asks you to "login with your Twitter account" username and password. They are not the same site, nor are they run by the same people or company. Some social network sites create public profiles for you without you having any contact with them. If there are any mistakes, they make you join in order to fix them. This sounds like blackmail: Join our service or else we'll continue to publish inaccurate information about you and therefore spam websearch results about you with misinformation. Several companies are trying to build the "one unified social network" (to rule them all) where they own/control the social network, and you're "allowed to" build applications on top of their proprietary platform. The most recent example of this is perhaps Facebook. This is a bad idea for the same reason you don't see "one universal blogging service". Socialstream - a Google sponsored project at CMU. Key quote: "a unified social network that, as a service, provides social data to many other applications". See also references in this Forbes article: Google's Secret Society. The hope is that these services will see the potential upside of providing open user profiles and social networks through social network portability and thus enable syndication of such data, as popular blogging services do.